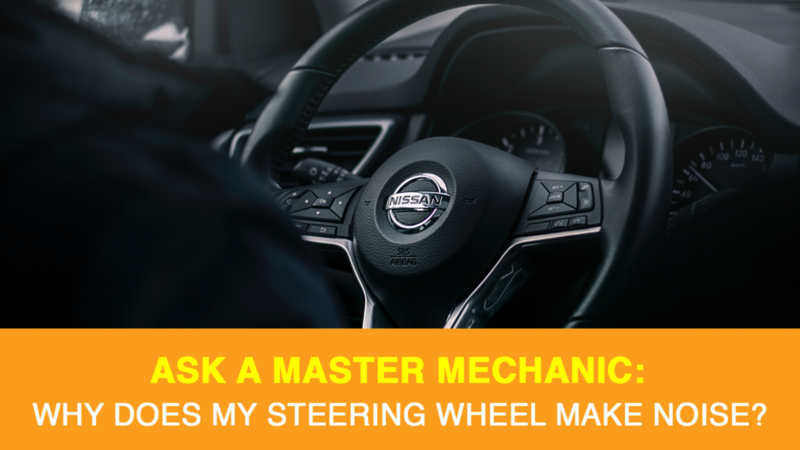 At Master Mechanic, there are a few questions we receive more than others. Many of them have to do with common noises that come from our customer’s cars. From squeaking brakes to ticking engines, we’ve heard it all (no pun intended). Today we’ll be talking about noises you hear when turning, their most likely causes, and what to do about it. When you make a turn in your car, you really shouldn’t hear any noise from your steering wheel. If you do, there could be an issue with your car’s suspension and steering system. The suspension and steering systems in your car work together to turn the vehicle when you turn the wheel. Considering the weight and speed of your car, you can imagine the stress turning puts on these parts. Over time, it’s common for them to wear down, resulting in an unpleasant whining, groaning, or rubbing sound when taking a turn. This might seem like nothing more than an annoyance, but you shouldn’t ignore these sounds. They could indicate the start of a serious problem and getting them looked at by your local Master Mechanic could save you money. If there’s a problem with one or more parts of your suspension or steering system, they’ll have trouble supporting the weight of your vehicle properly. Often, we hear a noise as a result of something not being able to move the way it should. In all cars, these parts will wear down eventually, and noises are the first warning sign. On top of the front strut is a bearing which is part of the front strut/spring assembly. These bearings support the weight of the front of the vehicle and allow the strut and wheel assembly to turn left and right. Over time as these bearings are exposed to the elements, the bearings can rust causing clunking noises and sometimes make it harder to turn the steering wheel. This can make low speed parking maneuvers difficult. If you are experiencing this type of issue have your vehicle inspected sooner than later. Your steering rack converts the rotary motion of the steering wheel into left and right motion which is transferred to the wheels allowing them to steer the vehicle. Due to constant steering input, even in normal everyday driving, steering racks eventually wear out. The internal seals are exposed to hot/high pressure power steering fluid and the seals become worn and brittle. If you are experiencing high steering effort when your vehicle mis cold but it improves as you vehicle warms up, your power steering rack may be worn out. The struts and shocks in your vehicle are built to last–just not forever. Eventually, they will wear down and the first sign is noise or extra bouncing when going over bumps. If the parts are not replaced, you’ll experience premature uneven tire wear and your vehicle ride quality will deteriorate. If they are worn badly enough your vehicle may become difficult to handle after going over bumps. A tie rod is part of the linkage that transfers motion from the steering rack out to the wheels. A worn or damaged tie rod can sometimes create a knocking noise, which is most apparent when you turn at lower speeds or drive over small bumps in the road. Ball joints enable the movement of the suspension control arms and steering knuckles. To move smoothly, it’s crucial that these joints remain lubricated at all times. If they become dry, they may start making squeaking or crunching noises when you turn the steering wheel at low speeds. Like your upper strut bearings, suspension bushings in your car won’t last forever. Once they start to wear, they break crack and eventually fall apart. If they fall disintegrate they will likely make a sound you won’t be able to ignore. Contact your local Master Mechanic to replace the suspension bushings as soon as possible. Power steering fluid provides the hydraulic pressure and also provides lubrication to the steering rack, which allows the driver to turn the steering wheel, easily, smoothly and efficiently. If there’s a leak in your steering reservoir system, then there may not be enough power steering fluid to achieve a smooth, effortless turn. Not only will it take more upper body strength to turn the steering wheel of your car, but you will hear noises when you do. The shaft between your steering wheel and steering rack is never completely straight. In order for the shaft to turn it has what is called a universal joint installed somewhere along its length. Over time the joints can become worn enough that they don’t move properly and can cause noise or stiffness while turning. The steering shaft and universal joint are usually replaced as an assembly. A problem with your suspension or steering system can be diagnosed quickly and easily by your local Master Mechanic. At Master Mechanic we’re trained to check your entire suspension system and steering system to uncover exactly what’s causing any noise. Based on a simple diagnosis, we can recommend the best course of action to keep your car running smoothly. We’ll also take a look at the state of the other parts in your suspension system and steering system to suggest the right maintenance schedule for you. If you have any questions or would like to book an appointment, contact your local Master Mechanic today! We’re always happy to help!